Each player will need a Battleground: Fantasy Warfare faction and access to the Monsters and Mercenaries expansion, unless you use the optional mercenaries rule. Battleground: Kingdoms can be used as a scenario generator to create a single battle or as a system to create a complete campaign. It can also be used to run tournaments. Battleground: Kingdoms is ideal for generating a scenario for a single battle. 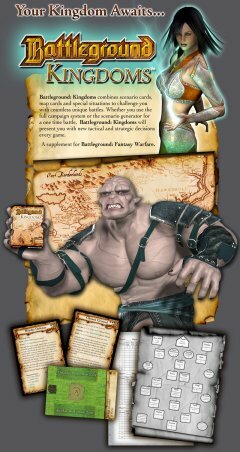 A Muster Card is included specifically to allow players to create single battles with the Scenario Cards and Map Cards that are also used for campaigns. Battleground: Fantasy Warfare is a great system for miniatures battles with cards instead of miniatures. And Kingdoms is an absolute must have for fans of the base game. It adds so much to the game by creating a context to each battle and even making it possible to link battles into a campaign. It is an entirely new way of enjoying Battleground: Fantasy Warfare, and it just works beautifully.